Groodles, also know as a Goldendoodles are relatively recent additions to Poodle crossbreds. They are the beautiful result of crossing a Poodle with a Golden Retriever. Similar to the Labradoodle, the Groodle also offers the benefits of high intelligence and a potentially low-shedding, low dander coat. The Groodle originated in North America. During the 1990s Groodles emerged as an alternative to the Labradoodle and Spoodle, though initially offering a larger dog than the Spoodle. The appeal of a friendly, intelligent dog and the prospect of a low-shedding, low dander coat have drawn dog lovers to the Groodle. Groodles are now bred in different size ranges, including Standard and Miniature. Groodles are frequently described as “gentle”. They are said to have both intelligence and a sunny disposition and because of their desire to please, Groodles make fantastic family companions. Groodles by nature love their families and do very well with children. They are intelligent and eager to please, making them easy to train. Groodles have shown good potential as working dogs. They are sometimes used as guide dogs, sniffer dogs, service dogs, and therapy dogs. A low-shedding coat provides an advantage when working with people. The first Groodle Seeing Eye dog was trained at Guide Dogs of America. Miniature Groodles are now also working as hearing dogs. Both parent breeds are highly intelligent and easy to train and these traits are passed on to the Groodle. 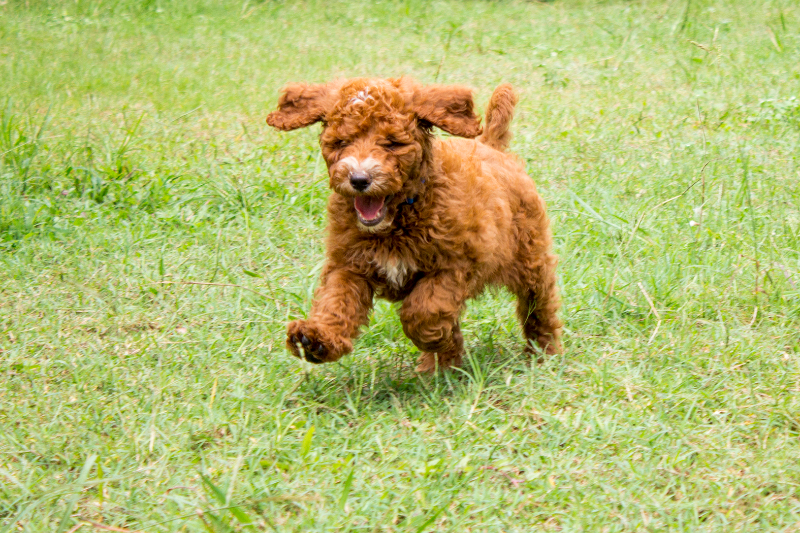 The Groodle size varies depending on the Poodle parent breed. Standard Poodles produce large Standard Groodles, Miniature Poodles produce smaller Groodles. Mulit-Generation Groodle breeders have also introduced Multi-Generation Labradoodle genetics for certain colours and traits. The Groodle has been developed to be a low dander, low shedding coat, trainability and to be an all round great family dog. The Groodlee has a long, thick coat and can sport long or short ears that hang downward. The Groodle sports a full facial beard as an adult. The Groodle’ss tail rides high up over its back and has a full plume. Their facial expression always makes them appear to be smiling. The coat is moderate in maintenance and requires combing every few weeks. Most owners choose to cut back the fur every few months to make the coat easier to maintain. Groodles require a moderate amount of daily exercise. They especially enjoy retrieving games and as both parent breeds are water dogs, Groodles love the water. Reds, Creams and Goldens, Black and Chocolates.